How often do you promise to take a little time off and do something centered around the family? Busy schedules keep everyone going in different directions, and it’s even hard to get your whole clan around the dinner table at the same time. This year, start a new tradition that takes advantage of chilly temperatures and your family’s love for fun. Set aside a couple of hours each week for the pure enjoyment of playing games. That winter weather outside is a perfect excuse to stay inside and rediscover the pleasure of classic competition or explore new avenues for family entertainment. 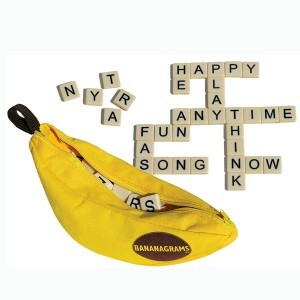 Let everybody get a favorite word in edgewise with the letter-tiled action of Bananagrams. Sweeten your fun with delicious hilarity when everyone gets Jelly Belly BeanBoozled. Do you enjoy tradition with a modern twist? Reverse Charades turns this simple game into an action-packed team sport. Hallmark games offer more than a great time for family and friends. Watch how quickly electronic gadgets get tossed aside when you start a round of Wits and Wagers. Even the littlest players laugh with excitement at Spot It or Elf on the Shelf. Everyone enjoys the fun, and Coppin’s Hallmark enjoys making it all so easy. Snuggle up in the den, or rally around the kitchen table, and let the warmth of family game play chase away the winter blues. Your Favorite Disney Characters in Cuddly Plush Form! Disney characters tend to bring out the best in people. Maybe that’s why fans of these lovable characters are so enthusiastic about following Mickey, Ariel, Tigger and other Disney figures wherever they appear. Itty Bittys plush figures are no exception. From Winnie the Pooh to Aladdin, Disney fans from all walks of life collect these tiny stuffed versions of beloved Disney characters. Collectors and fans of all ages love seeing their favorite Disney stories come to life in this charming, accessible format. Anyone can make space for an adorable Ariel, sweet Snow White or terrific Tigger. From desktop displays to shelves stocked with dozens of Itty Bittys, these compact stuffed toys make great additions to almost any living space. What’s more, there’s no worry about breaking or otherwise harming Itty Bitty figures; they can actually be played with in addition to being displayed. Most can also find room in their budgets for these affordable Disney collectibles. While some collectible toys are too expensive to give as gifts or even collect, these plush figures are quite reasonably priced. From holiday gifts to birthday presents, your favorite Disney fan will love receiving beloved Disney characters in plush form any time of year. Whether as a gift or to complete your collection, browse the Itty Bitty Disney collection at Coppins Gifts.